This post is in response to one by Rosa Rubicondior of atheist fame. I have reproduced her post entirely and inserted my responses in blue. Of course, all 'Intelligent Design' arguments are simple variations on the argument from ignorance and incredulity. Basically, the argument goes, "I don't know how this works and I can't believe it wasn't done by a god, therefore it was done by a god, and don't expect me to spoil my lovely argument by learning and understanding stuff." The first rule of honest argument is to represent your opponent’s position fairly. Intelligent design does not argue from incredulity, as you say. Rather, the argument goes as follows: “The theory of intelligent design holds that certain features of the universe and of living things are best explained by an intelligent cause, not an undirected process such as natural selection.” (http://www.intelligentdesign.org) There is no mention of God or incredulity in that definition. What are the features of living things that are best explained by an intelligent cause? We know from our uniform experience that things like complex molecular machines, or digital code in the DNA require intelligent agents to produce them. Even DNA itself could never have arisen by chance, let alone the information it carries. Taken together with the extreme improbability of finding anything by a random search that is genuinely a new biological function, and the even greater problem of the origin of life from non-life, one has to wonder why anyone would deny design. There are a large number of people who make a handsome living supplying people with that level of reasoning ability and intellectual (dis)honesty, especially in the USA where fundamentalist Christianity is a multi-billion dollar industry. That’s no argument, just ad hominem attacks with a bit of libel tossed in. No evidence adduced either. One of the originators of the under-cover wing of the Creationist industry, 'Intelligent Design' was biochemist, Michael J. Behe, who wrote a book called Darwin's Black Box which claimed that there are certain structures which are 'irreducibly complex' and therefore could not have evolved by the small steps proposed by Darwinian Evolution by Natural Selection. 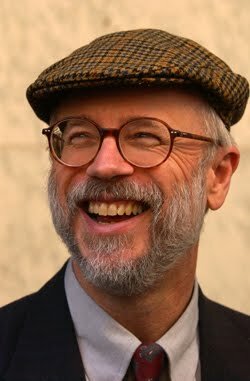 Michael Behe is a devout Catholic and talks almost exclusively to right-wing conservative Christian fundamentalist groups but denies his argument is merely biblical Creationism cloaked in a scientific-looking disguise which is intended to get round the First Amendment of the Constitution of the USA. That’s no argument either. You state categorically that intelligent design is an undercover wing of the Creationist movement. It’s not, and you have given no evidence that it is. You have not defined what it means to be irreducibly complex and made a case against it, you have simply moved on to guilt by association (it’s a crime to be a Catholic, especially a devout one?). And you keep using that term fundamentalist. I do not think it means what you think it means. It is generally meant to apply to people who take the Bible literally, especially with regard to the age of the earth. Behe is on record that he accepts the standard age of the earth, and allows for the possibility of limited unguided evolution. He also has no interest in overthrowing the government or undermining the Constitution. So if you are going to make such accusations you ought to produce something as evidence. 'Intelligent Design' and 'Irreducible Complexity' are major planks of the 'Wedge' strategy whereby right-wing fundamentalist groups continually try to insert their religion into schools and other government-funded bodies in order to subvert the Constitution and overthrow the safeguard of separation of church and state which underpins freedom of speech and freedom of conscience in a secular society. Once again that term “fundamentalist”. Intelligent design is not about “fundamentalist” religion, it’s about examining the evidence for design in the universe and in living things. Supporters of intelligent design are of all faiths and no faith. In fact, the famous atheist philosopher Thomas Nagel said in his book Mind and Cosmos that that we owe a debt of gratitude to Stephen Meyer, William Dembski and Michael Behe for raising the issue of intelligent agency. For a wonderful review of the book, go here. As for any desire to overthrow the government (again with that accusation), that’s an old canard. ID advocates don’t even advocate the teaching of intelligent design in classrooms, just that evolution be taught more fully, with evidence for and against. Behe's book was, of course, refuted within days of publication by proper biologists and he has never presented his ideas for peer review or to a conference of microbiologists, never-the-less it sold millions to creationists and is still widely quoted as if it were genuine science. Reviews were no doubt posted, but as to whether they refuted him, I doubt it. otherwise, why would they still be trying to do so ten years later? Proper biologists I take to mean those you agree with, which is not a recommendation. Michael Behe and David W. Snoke, “Simulating evolution by gene duplication of protein features that require multiple amino acid residues,” Protein Science, Vol. 13 (2004). Michael J. Behe, “Experimental Evolution, Loss-of-Function Mutations, and ‘The First Rule of Adaptive Evolution,’” The Quarterly Review of Biology, Vol. 85(4):1-27 (December 2010). Behe's two books haven't sold millions--there aren't that many biology geeks in America, and young earth creationists would not approve of it. Ironically, one of the main structure he relied on was the flagellum of the motile bacterium Escherichia coli. This is ironic for a number of reasons, not the least of which is the fact that the precursors of the 'proton motor' which powers the flagellum, and which is the nearest thing to a wheel known in nature, albeit it's the 'axle' which spins round, not the wheel, are known, so very plausible mechanisms for its evolution can be described. See also Evolution of the Bacterial Flagella. Plausibility is in the eye of the beholder. It requires that numerous proteins be recruited to new functions and adapted to new binding partners. The difficulty of such recruitment has been shown by Gauger and Axe, who examined how hard it would be to get one of two very similar proteins to adopt the function of the other. Despite a greater degree of similarity than many of the supposed flagellar precursor proteins, the shift in function was beyond reach of purely unguided processes. 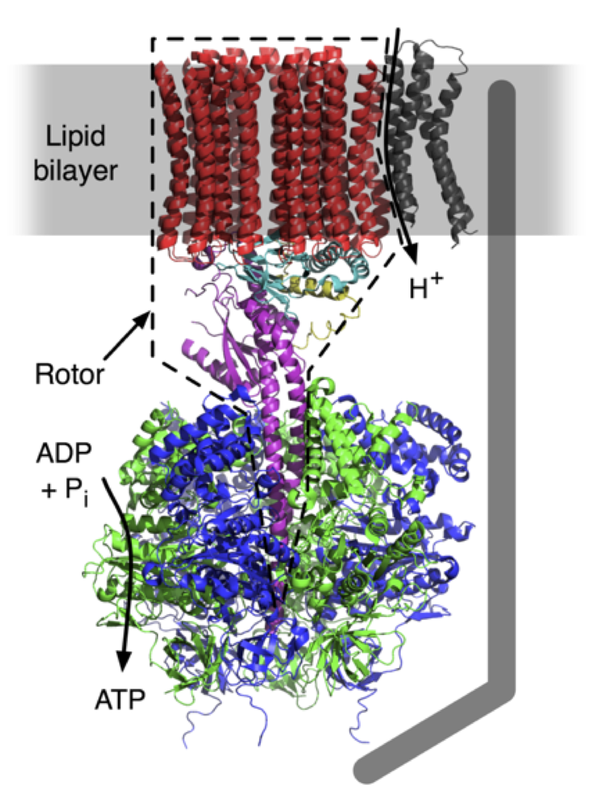 Here’s an image of another molecular machine with a rotor and stator (the stator is represented by a grey bar). It’s called ATP synthase, and like the flagellum, it’s a complex of multiple proteins that have to work together. 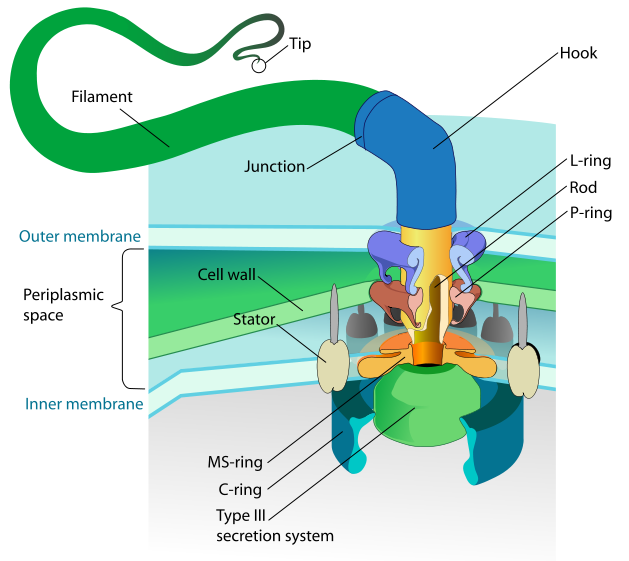 The complexity and the interactions of the various component proteins are more obvious here than in the cartoon illustration of the flagellum. But Behe's claim falls down in another area: the necessary 'complexity' to produce a flagellum is not in the component proteins and how they are assembled but in E. coli DNA. There is no record of Behe having investigated the 'complexity' of E. coli DNA to determine if it is indeed irreducibly complex in respect of the flagellum because he has never carried out that study. OK, this is just wrong. DNA performs no functions in the cell except to store information. Proteins carry out all the heavy lifting. The proteins are plenty complex. You saw the picture of ATP synthase. The proteins have to be folded into precise shapes to be able to fit together, and there’s only one way to fold them right. For a review of the difficulty of evolving new proteins or adapting old proteins to new functions, go here. The irreducible complexity of the flagellum can be easily demonstrated. Remove any number of its components and it ceases to function. To go the other direction, from a simpler Type III secretory apparatus, to a more complex flagellum, requires the simultaneous solution of multiple problems. Half a flagellum is the same as no flagellum at all to the cell. The second irony is that E. coli and its related bacteria are a good example of evolution. The genera Escherichia and Salmonella diverged around 102 million years ago (credibility interval: 57–176 mya), which coincides with the divergence of their hosts: the former being found in mammals and the latter in birds and reptiles. This was followed by a split of the escherichian ancestor into five species (E. albertii, E. coli, E. fergusonii, E. hermannii and E. vulneris. The last E. coli ancestor split between 20 and 30 mya. See also Wikipedia - Escherichia coli Phylogeny of Escherichia coli strains. Saying that something evolved, meaning it changed over time from one thing to another, says nothing about how it happened. Intelligent design does not deny that things change over time, or even that small scale change, like antibiotic resistance or finch beaks, are the result of mutation and selection. It simply questions whether Darwinian mechanisms are the cause of new information or innovation, or larger scale changes, like flight, or metamorphosis, or new kinds of animals. The E. coli long-term evolution experiment is an ongoing study in experimental evolution led by Richard Lenski that has been tracking genetic changes in 12 initially identical populations of asexual Escherichia coli bacteria since 24 February 1988. The populations reached the milestone of 50,000 generations in February 2010. Since the experiment's inception, Lenski and his colleagues have reported a wide array of genetic changes; some evolutionary adaptations have occurred in all 12 populations, while others have only appeared in one or a few populations. 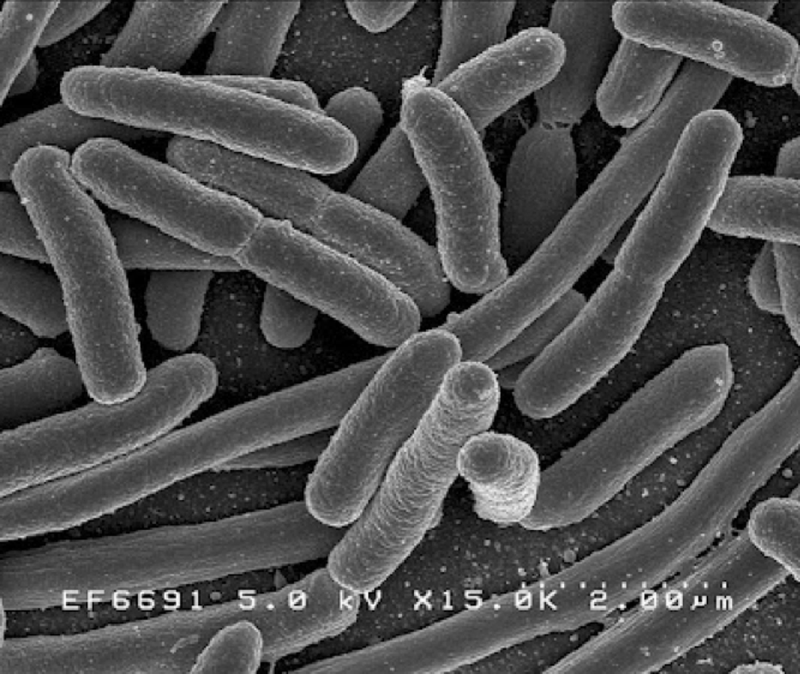 One particularly striking adaption was the evolution of a strain of E. coli that was able to grow on citric acid in its growth medium. Lenski’s long term experiments are my favorite example of the limits of unguided evolution. The vast majority of the mutations they found were energy-saving deletions or inactivations of unnecessary genes, to allow cells to grow more efficiently under starvation conditions (the growth medium had only a little glucose, which the cells could use, and lots of citrate, which the cells couldn’t use). Notice these were losses of information, not gains. They actually deleted genes that they could never get back when conditions changed and the genes were needed again. The one apparent exception was when a strain developed the ability to metabolize citrate. But even here, what happened was a reworking of existing information. The cells had always had the ability to use citrate under anaerobic conditions (that is, when no oxygen was present). When grown in the presence of oxygen they couldn’t use citrate, because the genes for transporting citrate into the cell were shut off. In this new strain that could metabolize citrate, it turned out that a bit of DNA was moved to a new position. This allowed the transport genes genes to now be turned on in the presence of oxygen. Ta da! A strain that now could grow on citrate was created. But no new information was created--existing information was simply used under new conditions. But my favourite irony in Behe's choice of E. coli as his example of 'Intelligent Design' is in what E. coli can do. One strain is a normal, even beneficial part of our gut 'flora', i.e. the collection of micro-organisms which live in our digestive tracts, the dead bodies of which constitute a large part of the volume of our faeces. E. coli helps control some other organisms which, if they become too numerous may be harmful. However, some strains of E. coli are far from 'friendly' and even our 'friendly' ones are far from friendly if they get into our blood where they can become seriously pathogenic, even fatal. Some strains are highly dangerous and great care must be taken to prevent them getting into our food. The supreme irony here is that this pathological tendency of E. coli is enhanced greatly by its motility, which depends entirely on its flagellum. If we are to believe Michael Behe we have to believe his intelligent designer designed a mechanism for helping a bacterium make us sick and even kill us, presumably, because it loves us so much. How odd. Flagella are for swimming. Let’s not confuse secondary effects with primary ones. It seems to be a peculiarity of bacteria that invade our gut that they have to be able to swim. Developing the capacity to stick to epithelia (the cells lining the gut) is secondary. Flagella weren't "designed" to be toxic; lots of non-toxic bacteria have them. They are designed for swimming. Other pathogenic bacteria infect by other mechanisms. Y. pestis, the bacterium that causes the plague, enters through the blood stream. Such bacteria either lack flagella entirely, or turn them off when invading a mammalian host. There’s a good (bad from our point of view) reason for this. Our immune systems recognize and target cells that make and secrete a particular flagellar protein. To evade our defense system, the bacteria shut down their flagella, some of them permanently, because they don’t need to swim. Untrammelled by little inconveniences like facts, this paragraph is ad hominem and defamatory from beginning to end (highlighted in yellow). At least the previous paragraphs made an attempt at an argument. If you expect to be taken seriously by intelligent people, your level of prose will have to rise a bit. Behe has you beat hands down. This is a response to a post made by Rosa Rubicondior (the one who uses that name on Twitter). I have copied a blog by this name, and it is reproduced here in black type. My responses to Rosa Rubicondior are in blue. You have to pity Creationists. If only they would (or should that be 'could'?) think things through! I blame the leaders of this money-making industry and right-wing political control cult; people like Ken Ham, Duane Gish, Kent Hovind, Michael Behe and William Dembski who feed off these unfortunate victims in return for worthless pseudo-scientific pap, and so release them ill-prepared in terms of reasoning ability and facts, onto the Internet to try to push their lost cause to people who actually understand biological science, as though that was ever going to be remotely possible. It almost constitutes child abuse, even for the chronologically adult Creationist children. Name calling is an indication of a weak argument, Rosa. You continue to conflate different groups. Ken Ham, Duane Gish, and Kent Hovind are young earth creationists. I don’t know anything about their scientific qualifications or fund-raising methods. I do know something about Michael Behe and William Dembski, however. Behe is a tenured biochemist with peer-reviewed scientific articles and books to his name, and William Dembski is a mathematician, also with peer-reviewed books and articles. You, however, have a knack for run-on sentences and invective. I know nothing about your scientific credentials, but from what I have read you appear to have only a rudimentary understanding of biology, with a lot of things you say just plain wrong. I can understand that there is little money to be made trying to educate Creationists - indeed it is to avoid the need to bother with learning science that attracts so many of them to the cult in the mistaken belief that saying 'God did it!' is going to put them on an equal footing with real scientists who have even passed exams and things - but surely they have a moral duty of care not to make their hapless victims look quite so infantile and uneducated in full view of the world, don't they? “Even passed exams and things?” Is that your idea of a scientist? Here is an example of your ignorance. To have a PhD, let alone two, as William Dembski does, “passing exams” is only the beginning. He also had to do original scientific research, publish peer-reviewed papers, and defend his work before a committee of at least three faculty members. Behe had to do the same thing. Then as post-doctoral researchers they continued their training. So by to say that they have not learned science is infantile and uneducated, both. But then, which right-wing Creationist parasite is interested in morality? Isn't morality for softies? Does money in the bank have morals? Unsubstantiated name calling and smearing of someone’s character (with no evidence, I might add) is not an argument. Rather, it's a sign of a weak argument and weak character. 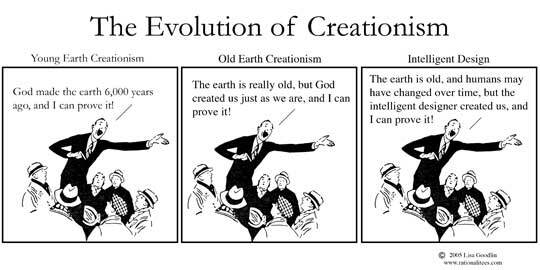 Take for example the incessant clamour from Creationist for a complete set of human fossils showing every evolutionary step in detail, as though the absence of this complete series utterly refutes Darwinian Evolution by Natural Selection, just like the parasites who took their money told them. In fact, of course, even if no fossil had ever been found, Darwinian Evolution would still be irrefutably supported by genetic, biochemical and anatomical evidence, as well as by geology, cosmology, physics and mathematics. 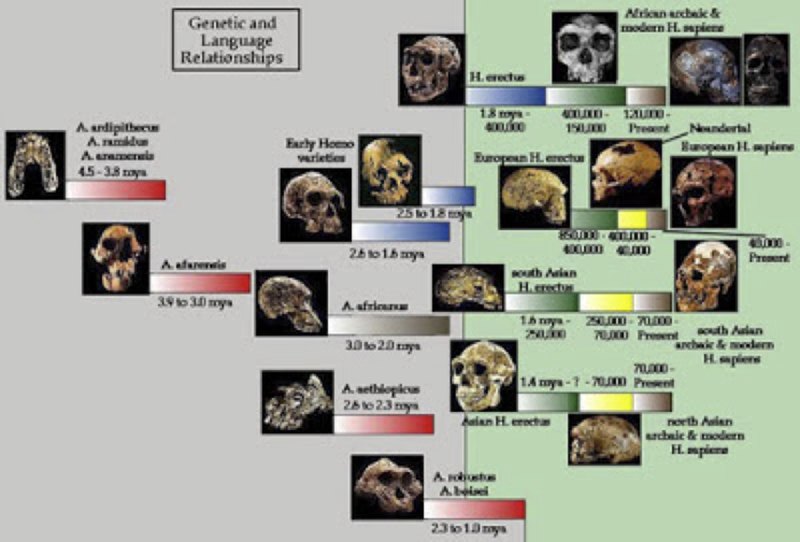 This chart appears to show a complete evolutionary trace of hominin evolution, but what hides behind the convenient connecting bars is the absence of a connection. To the left are australopithecine species (genus Australopithicus). To the right are representatives of the genus Homo, including Homo erectus and Homo sapiens. There is a distinctive morphological gap between australopithecines and Homo erectus (as evidenced by their different Genuses). We’ll deal with the claim about genetic, biochemical, cosmological, physical and mathematical claims when they come with some evidence attached. But why should they expect to see a complete series of fossils from any evolutionary history of any species? This would be quite extraordinary, especially for terrestrial species like the ape family and it's post-aquatic ancestors. Fossilization is an extremely rare and unusual event outside an anoxic marine sediment environment where it's still not very common, otherwise we would be quite literally climbing over mountains of pure fossils, as a moment of intelligently designed thought would have told them. To climb over mountains of fossils would require that every individual who died become fossilized. That is absurd. But it’s not unreasonable that in the last 150 years some fossil that bridges the gap between Australopithicus and Homo should have been found. After all, we have found plenty of the other hominins. But an intermediate fossil has not been found. Even paleontologists recognize the gap between the two groups (see below). In practice of course almost all dead bodies are eaten either by micro-organisms or larger scavengers (that smell of a road kill that's been a couple of days in the sun is not a fossil being formed) and even the rare piece of surviving bone or teeth will usually be dissolved and will disappear in a few years. It is true that most animals' bodies decay before they can be fossilized. Yet we have dinosaurs from 200 million to 60 million years ago, but we still lack fossils from 2 or 3 million years ago (the time frame between australopithecines and Homo erectus). The only ones we have are either Homo or Australopithecus individuals. In fact, so unlikely is it that a fossil would be laid down for every generation (the only complete series that would satisfy Creationists) for the whole of human and pre-human evolution, in conditions in which it would have been discovered since we started actively looking for them about 150 years ago, that it would be very hard for science to explain it. Setting up a straw man, Rosa? That sentence doesn't parse, but I'll try. Are you saying we should have found these fossils because the proper conditions exist? Didn't you argue the other thing just above? So which is it? By the way, no one expects so many fossils, certainly not one for every generation. One fossil connecting Australopithecus and Homo would do. The discovery of such a complete series of human and pre-human fossils, the series that Creationism, and its under-cover wing the Intelligent Design industry, demands, would itself be evidence of intelligent design. It would be so unlikely that the probability of it occurring would be vanishingly small. It would be so hugely unlikely that some sort of intelligent intervention would need to be seriously considered as an explanation - which is why we can be as near certain as makes no difference that such a complete series of human fossils will never be found. We are not talking about a complete series. We are talking about one fossil that bridges the gap between ape-like australopithecines and Homo erectus, with a mostly modern human skeleton and slightly smaller cranium. To help you understand the gap I have included a picture taken from a peer-reviewed paper: Hawks, Hunley, Lee, and Wolpoff. “Population Bottlenecks and Pleistocene Human Evolution.” Journal of Molecular Biology and Evolution 17 (2000): 2-22. be sure to read the caption below. Here's another from Science and Human Origins, by Gauger, Axe, and Denton, based on a figure from D.M. Bramble and D.E. Lieberman, “Endurance running and the evolution of Homo,” Nature 432 (2004): 345-352. 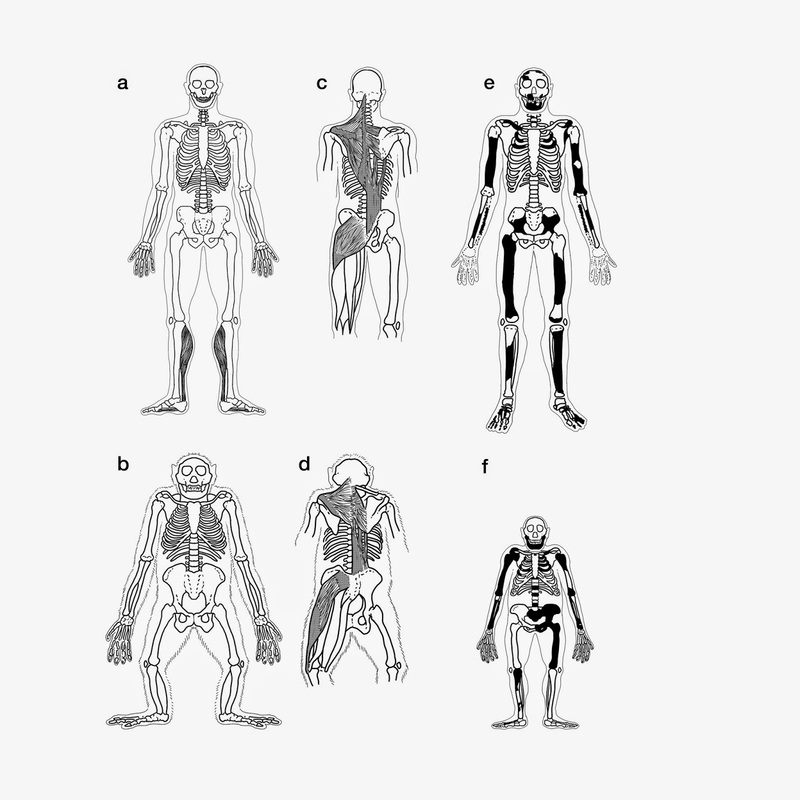 On the bottom row are a chimp (left) and A. afarensis (right). 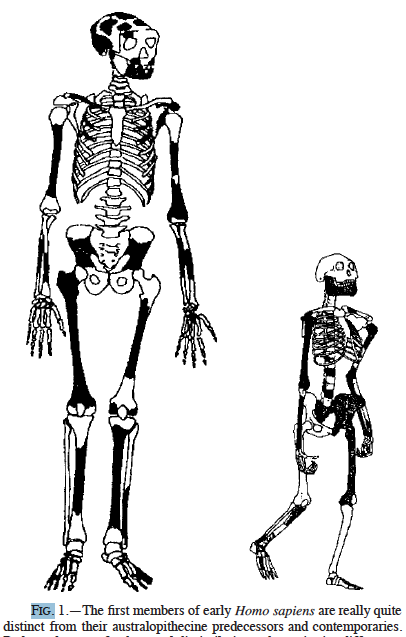 On the top are a modern human (left) and Homo erectus (right), the first member of the genus Homo. It's easy to see that A. afarensis is chimp-like more than it is human-like, and that there is a big gap in morphology between A. afarensis and Homo erectus. You see, what any decent Creation 'scientists' who cared about the reputation of those whom he was priming to make fools of themselves on the Internet would do would be to tell them not to be so stupid as to keep pointing out that there is an incomplete, gap-ridden fossil record of human evolution, which is exactly what science expects and which is evidence against intelligent design. Maybe you should stop calling people stupid when you have the facts so wrong. The fossil record does have gaps. It’s inconvenient that the gaps fall where they do, isn’t it, Rosa? The “incomplete, gap-ridden” fossil record fails to show a fossil in between ape-like australopithecines and Homo, though we have plenty of the others. So, all claims of our origin from ape-like ancestors are not supported by the evidence. Maybe they over-estimated the intellectual abilities of their credulous victims and expected them to work out these simple pieces of logic for themselves. Or maybe they just hoped intelligently designed flying pigs would tell them. More name calling. Speak for yourself, Rosa. Maybe you have underestimated the intelligence of your readers.